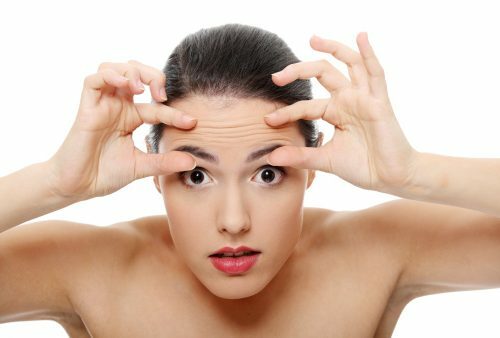 The sight of your first wrinkle may cause you to cringe and start to look for anti-aging tips that will help to reduce the appearance of them. There are many products on the market that promise to have anti-wrinkle effects, but do they actually work? According to Mayo Clinic, there are anti-wrinkle treatments that may help to reduce the appearance of wrinkles. Treatments are classified into topical creams and surgical/other procedures some of which may seem extreme for some people. .
1. Topical Retinoids – retinoids, which are derived from vitamin A, may help to reduce the appearance of wrinkles, uneven skin coloration and skin roughness. These topical creams are usually prescribed by your doctor. However, there are many non-prescription anti-wrinkle creams available as well. If you are going to select a non-prescription anti-wrinkle cream, opt for products that have the highest concentration of an active ingredient for best results. 2. Botox injections – this involves an injection into muscles of the face that causes the skin to flatten and appear smoother because the muscles can’t tighten. In order to maintain the effect, repeated injections are necessary as typical injections will only last about three to four months. 3. Fillers – soft tissue fillers can be injected into the deep wrinkles that appear on the face which will help to smooth out wrinkles. These fillers include fat, collagen, and hyaluronic acid. As with Botox, soft tissue filler injections may need to be repeated for lasting anti-wrinkle effects. 4. Micro-dermabrasion – A vacuum suction is applied with aluminum oxide crystals to remove the top layer of skin cells which provides a more even texture to the surface of the skin and fine lines and wrinkles are minimized. Again, repeated treatments are usually necessary to sustain anti-wrinkle effects. 5. Laser/Light Therapy – Energy from a laser or pulsed diode light removes the top layer of skin which stimulates the growth of new collagen fibers, this results in smoother looking skin. Several treatments are usually needed to see results. It is important to remember that as you age, changes will occur to your skin and no treatment will completely stop the changes associated with aging. Multiple, repeated anti-wrinkle treatments are often needed to maintain the look of wrinkle free skin. Before considering these treatment options, speak with your medical provider to determine if it is suitable for you. 1. Protect your skin from the sun – wear sunglasses and hats with wide brims to protect your face and always wear sunscreen when outdoors. Choose products (moisturizers, lip balms, etc.) that contain SPF that protect against UVA and UVB rays. 2. Moisturize – while moisturizes won’t prevent wrinkles, they may help to provide an anti-wrinkle effect by masking the lines and creases. 3. Quit Smoking – this is one of the most important anti-aging tips, in addition to improving skin tone and preventing future wrinkles from appearing, quitting smoking has numerous other health benefits. 4. Eat healthy – incorporating plenty of fresh fruits and veggies into your diet may have an anti-wrinkle effect, although future research is needed in this area. 5. Get enough sleep – getting enough rest is essential for the production of growth hormone. Growth hormone helps to maintain the skins elasticity, providing an anti-wrinkle benefit.